Musagetes and the Improvisation, Community, and Social Practice (ICASP) project usher in the 2013 Improviser-in-Residence program with Brampton artist, Rich Marsella. Join Musagetes, ICASP and Rich Marsella to launch the 2013 Improviser-in-Residence Program on Saturday, May 25th from 7-9 PM at Musagetes (Suite 103, 6 Dublin St. South, Guelph ON). 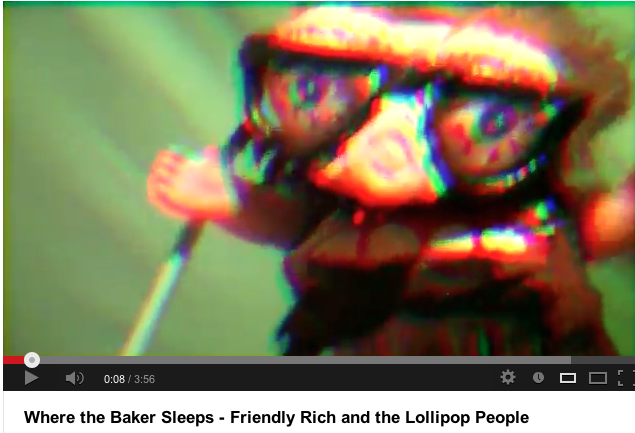 The launch will feature drinks, snacks and a performance by Friendly Rich and the Lollipop People. We hope to see you there! This concert will be their first appearance in Guelph and will be followed by a monthly concert series at Silence (46 Essex St. Guelph), and a special Halloween concert for the University of Guelph’s Thursday at Noon Concert Series in MacKinnon 107. The residency will run April-September 2013 and will culminate in a performance at the Guelph Jazz Festival on Saturday, September 7th at 12:00 PM at St. George’s Church (99 Woolwich St.). Stay tuned to musagetes.ca and improvcommunity.ca for updates! The collaborative partnership of ICASP and Musagetes is proud to continue the Improviser-in-Residence program, now in its third year. From the moment Jane Bunnett, the first Improviser-in-Residence, undertook the role in 2011 the program has been a resounding success and continues to ignite community interaction, research communication, and musical dialogue. Last year the exuberance and musicianship of the program centered around three amazing improvisers: New York sound artist, Miya Masaoka, followed by interdisciplinary artists, Scott Thomson and Susanna Hood. 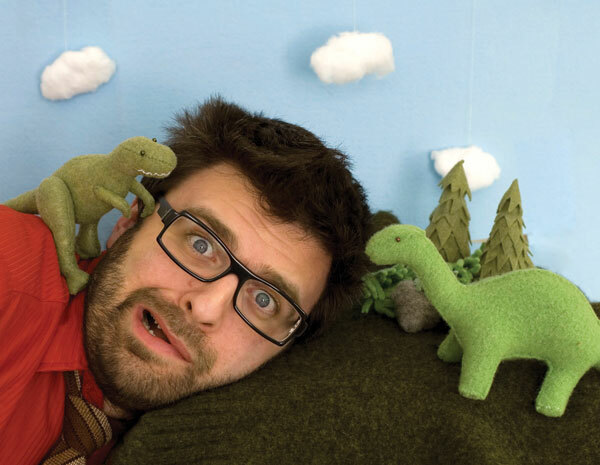 The excitement around the program continues as ICASP and Musagetes introduce Rich Marsella who will bring his collaborative style of composition and oddball aesthetic to Guelph this summer as the 2013 Improviser-in-Residence. In this role, Marsella will initiate workshops alongside ensemble musical performances to promote and advocate community building and diversity through improvisatory practices. Remarking on his role as the new Improviser-in-Residence, Marsella said, “It’s a chance to connect with Guelph in a way that I’ve always dreamed of. There’s something special in Guelph, and I want to tap into it and celebrate it with this project.” Marsella plans to work with as many local organizations and musicians as possible to bring his remix project to life: an arrangement of Nikolai Rimsky-Korsakov’s epic piece, Scheherazade. Shawn Van Sluys, Executive Director of Musagetes, comments, “Now that the Improviser-in-Residence program is in its third year, we’re seeing evidence of how artists like Rich Marsella, Jane Bunnett, Scott Thomson and Susanna Hood build communities through the co-creation of music. Musagetes is committed to continuing this work of making the arts a central part of our lives.” The Improviser-in-Residence program helps to accomplish this by using improvisation as a locus to facilitate unique creative collaborations across boundaries. Throughout the summer of 2013, Improviser-in-Residence Rich Marsella will be directly engaged with the Guelph community through a series of performances, and innovative collaborations with a variety of community-based organizations. The main focus of Marsella’s residence in Guelph will be an installment and tribute to Russian composers, using Rimsky-Korsakov’s Scheherezade as a starting point. Marsella will dramatically rearrange Scheherezade, and rather than the violin, Marsella intends to place electric guitar at the centre of the piece. Marsella comments that he “will treat this piece as a concerto for electric guitar, with as many interesting ensembles as possible to help colour the arrangement.” Marsella imagines a Theremin ensemble, a whistle choir, a turntable ensemble, a ukulele ensemble, a symphony orchestra and more, all coming together with people of all ages and musical abilities to bring this extravaganza to life. The final piece will bring together a unique group of artists and community members, culminating in a performance at the Guelph Jazz Festival on Saturday, September 7th at 12:00 PM at St. George’s Church (99 Woolwich St.). 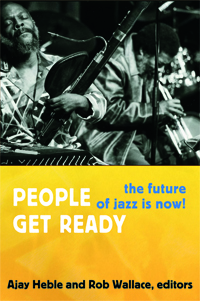 Rob Wallace (ICASP Research Associate) and Ajay Heble (ICASP Project Director) co-edit a new collection on jazz studies: People Get Ready: The Future of Jazz is Now! In People Get Ready, musicians, scholars, and journalists write about jazz since 1965, the year that Curtis Mayfield composed the famous civil rights anthem that gives this collection its title. The contributors emphasize how the political consciousness that infused jazz in the 1960s and early 1970s has informed jazz in the years since then. They bring nuance to historical accounts of the avant-garde, the New Thing, Free Jazz, “non-idiomatic” improvisation, fusion, and other forms of jazz that have flourished since the 1960s, and they reveal the contemporary relevance of those musical practices. People Get Ready offers a vision for the future of jazz based on an appreciation of the complexity of its past and the abundance of innovation in the present. 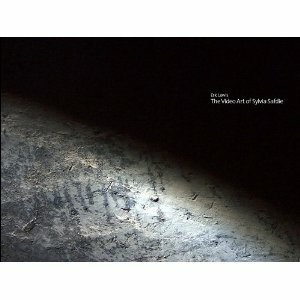 Some of the contributors include: Ajay Heble, Vijay Iyer, Thomas King, Tracy McMullen, Paul D. Miller/DJ Spooky, Nicole Mitchell, Roscoe Mitchell, Aldon Lynn Nielsen, Marc Ribot, Matana Roberts, Julie Dawn Smith, Wadada Leo Smith, Alan Stanbridge, John Szwed, Greg Tate, Scott Thomson, Rob Wallace, Ellen Waterman, among others. For more information, and to order the book directly from Duke University Press, please click here. "The pedagogy of the oppressed, as a humanist and libertarian pedagogy, has two distinct stages. In the first, the oppressed unveil the world of oppression and through the praxis commit themselves to its transformation. In the second stage, in which the reality of oppression has already been transformed, this pedagogy ceases to belong to the oppressed and becomes a pedagogy of all people in the process of permanent liberation." 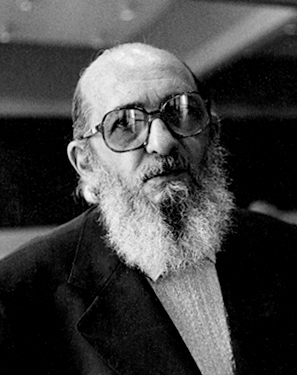 Paulo Freire was a Brazilian philosopher, perpetual educator, and a significant theorist of critical pedagogy. 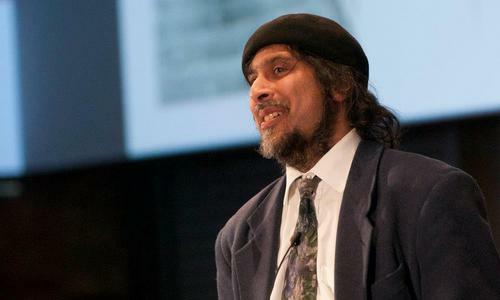 He is most known for his seminal work, Pedagogy of the Oppressed. Freire remained an ardent advocate for the dialogical process of pedagogy, believing that students should have an equal opportunity to express their opinions with their peers and instructors. Rather than be beneficiaries of curricular knowledge, students and the oppressed could become co-performers—improvisers—of putting knowledge and theory into practice to change the world. 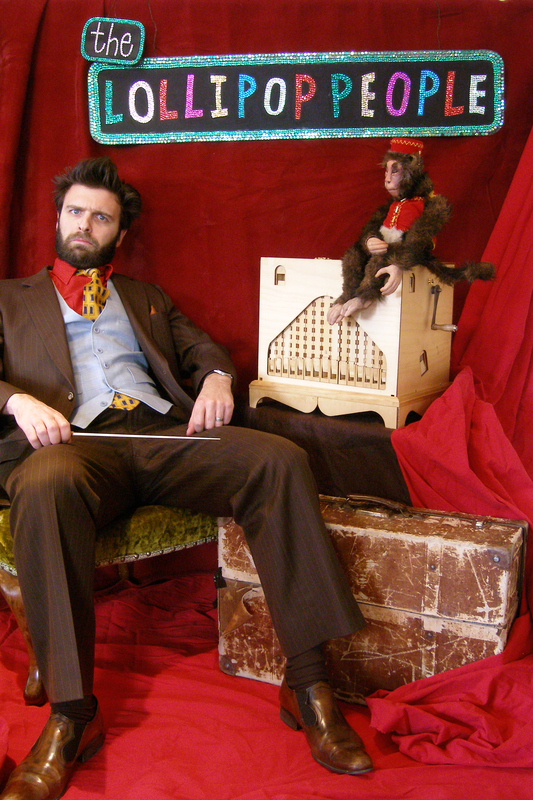 Rich Marsella, the 2013 Improviser-in-Residence, is also this month’s artist of the month. 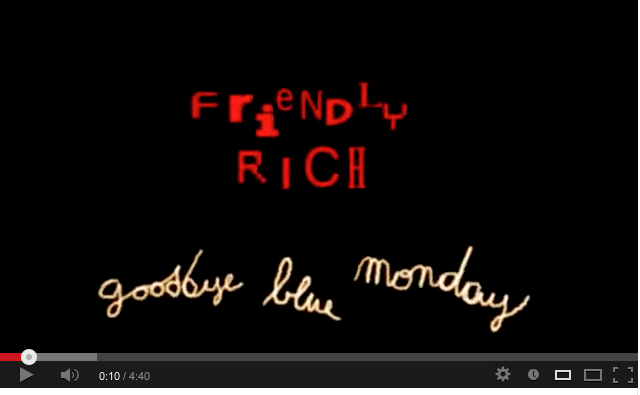 Rich Marsella, known as Friendly Rich, is a composer and avant-garde musician from Brampton, Canada. His music is incredibly eclectic and has been featured on everything from CBC Radio and MuchMusic to three seasons of MTV’s The Tom Green Show. Since 1994, Marsella has recorded a great deal of material exclusively for his own distinguished record label, The Pumpkin Pie Corporation. Marsella has a Masters degree in music from the University of Toronto, which he completed under the supervision of Dr. Lee Bartel and composer R. Murray Schafer. His main area of focus included instrument construction as well as parade pedagogy. In addition to producing and composing 9 full-length albums to date, Friendly Rich Marsella is also the Founder and Director of the Brampton Indie Arts Festival, an annual event that promotes emerging artists including musicians, poets, and visual artists, held every year since 2000. Marsella and his live ensemble, The Lollipop People, signed a deal with German record label, Hazelwood Records, to release two albums in Europe, which they have since toured three times, releasing three records there to date. Currently Marsella is the Director of the Regent Park School of Music, providing a valuable musical outlet to youth-in-need. Rich Marsella’s coalescing of community engagement with creative musicianship makes him an apt fit for the Improviser-in-Residence program. 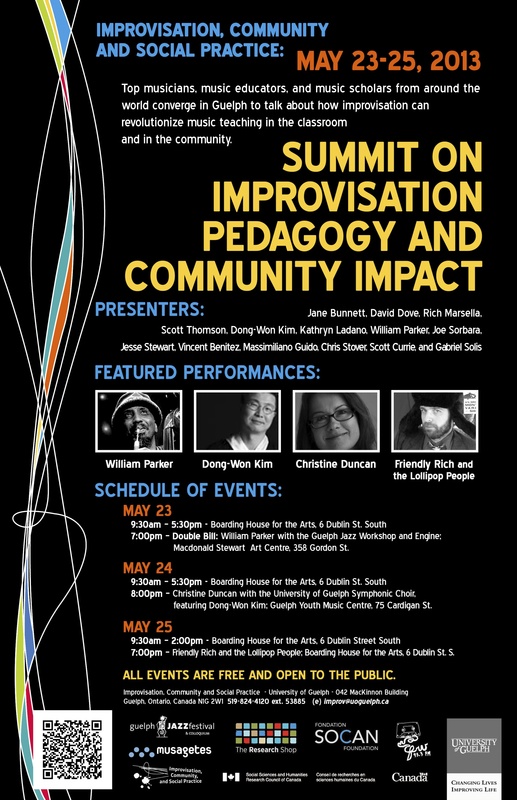 Innovative and thought-provoking Improvisation Summit to take place in Guelph from May 23rd to 25th at Boarding House for the Arts. 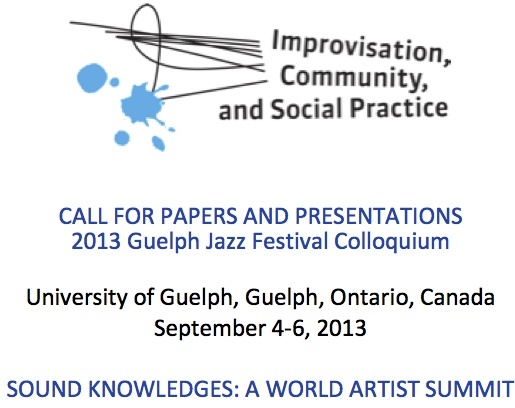 The Improvisation, Community, and Social Practice (ICASP) project, with generous support from the Social Sciences and Humanities Research Council (SSHRC) and community sponsors, is delighted to present roundtables, panels, workshops, and first-rate performances from some of the finest music educators and improvisers working in the world today. The best part: it’s all free and open to the public! 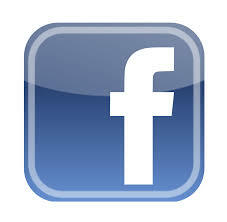 Where: 6 Dublin Street South, Guelph at Boarding House for the Arts. From May 23-25, The Summit on Improvisation Pedagogy and Community Impact will bring together some of the top musicians, music educators, and music researchers from around the world. We will hear from leading thinkers on improvisation and pedagogy as they present their current research on the subject and discuss their own experiences as teachers, students, and researchers of improvisation. The Summit will include a number of performances. On Thursday, May 23 at 7 pm, the Macdonald Stewart Art Centre will see a double bill featuring the acclaimed Toronto jazz quintet Engine in concert with a group of Guelph musicians under the direction of renowned bassist William Parker. On Friday evening, at 8 pm, the community will be treated to a performance from Christine Duncan with the University of Guelph Symphonic Choir. 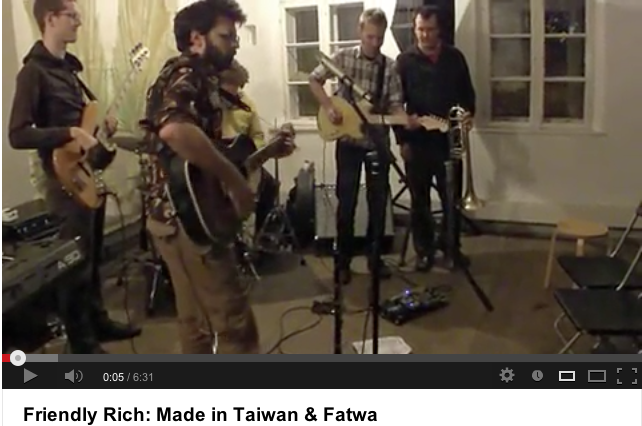 Saturday night will culminate around the launch of ICASP and Musagetes’ 2013 Improviser-in-Residence, Rich Marsella. The Silence concert series continues to build momentum in Guelph with numerous innovative concerts and events every month. Make sure to catch Juno Award winners Stretch Orchestra, incredible free-jazz bassist, William Parker, and others this month. Check out the Silence event page for the latest in inventive music in Guelph. Jazz Art Auction a Major Success! Thanks to all who attended the Guelph Jazz Festival's Sounds Provocative Art Auction at The Holiday Inn Guelph Hotel & Conference Centre as art lovers bid on over 50 works created by some of the region's best-known contributing artists. The 8th annual event and chief fundraiser for the festival hosted a live and silent auction on Sunday April 21st, estimated to have raised nearly $35,000. The funds generated will contribute to this year's festival, its 20th Anniversary. To read more visit the Guelph Jazz Festival website.